Name is pronounced oo-BAHL-doh hih-MEHN-ehz…Originally signed by Colorado as a non-drafted free agent on 4/25/01…Won a regional Emmy in 2011 as the voice talent for "Rockies All Access: Baseball in the Dominican" with ROOT Sports…Became a U.S. citizen on 9/12/16...Married, wife's name is Marivi...The couple has a daughter, Jimevi. Spent first full season with the Indians, finishing with a 9-17 record, the most losses by an Indians pitcher since Tom Candiotti in 1987 (18)...In addition to leading the AL in losses, he led the league in wild pitches (16) and finished 2nd in walks, 5th in runs allowed and 6th in earned runs allowed and finished 34th out of 36 American League ERA qualifiers. Did have stretches of success, going 3-3 with a 2.93 ERA in 7 starts from June 1-July 7 (46.0IP, 38H, 15R/ER, 16BB, 44K) and had an ERA of 2.78 in 5 June starts (32.1IP, 25H, 10R/ER, 12th lowest ERA in the AL)...Only other monthly ERA under 5.00 was April (4.50, 4GS)...Recorded his 12th career double-digit strikeout game on August 9 vs. Boston, a season-high 10K...Recorded zero walks in one start on the year (June 10 at STL, 7.0IP)...From June 10-August 31 fanned 94 batters over 91.1 innings covering 16 starts (9.3SO/9.0IP)...For the season averaged 7.3SO/9.0 innings pitched, 16th among American League starters and tops on the staff. Allowed just 1 hit over 7.0IP in his 2012 debut on April 7 vs. Toronto (ND, 7.0IP, 1H, 2R/ER, 3BB, 3K)...Served 5-game suspension handed down by MLB, April 8-14, stemming from spring training incident at Colorado on April 1...Won consecutive decisions two times on the year and finished the year with a career-high equaling 6-game losing streak from August 14-Sept 22 (6.49ERA, 43.0IP, 52H, 31ER, 18BB, 35K)...Season ended after start of September 22 at KC (4.1IP, 7H, 5R/ER) due to a sprained right ankle, missing his last two turns thru the rotation...Was 1-10 with a 6.99ERA in 14 second half starts (74.2IP, 94H, 58ER, 37BB, 66K, .304AVG) as he dropped his last 6 decisions on the year from August 14-Sept 22 to carry a career-high losing streak into 2012. ERA in his 14 wins/no decisions was 2.69 (87.0IP, 26ER, .225avg)...32 steals off him (most in AL) against 5 caught stealing against...ERA at home (3.70) was three points lower than his road ERA (6.82)...ERA in the first inning was 6.39 (31.0IP, 43H, 22ER) as he pitched into the 8th inning just one time on the season...Batters hit .270 (86-319) off him with runners on base and .240 (49-304) with RISP; .216 (19-88) with RISP-2outs. High profile mid-season acquisition went a combined 10-13 w/a 4.68 ERA in 32 starts between Cleveland and Colorado(188.1IP, 186H, 98ER, 78BB, 180K, .254AVG)...His 180 strikeouts were tied for 26th in Major League Baseball andhis 8.6 strikeouts per 9.0IP were 14th in MLB ahead of Jon Lester, Felix Hernandez & Roy Halladay...His 2CG finishedT9th in the NL despite not pitching in the Senior Circuit after July 30...His 132 starts since 2008 are T7th most in MLB...Went 6-9 w/a 4.46 ERA (123.0IP, 118H, 68R/61ER, 51BB, 118K, .251 avg) and 2CGs in 21 starts w/Colorado priorto being acquired on July 31 by the Indians...At the time of the trade he was 8th among National League pitchers instrikeouts per 9.0IP (8.6), 15th in strikeouts (118) and 21st in batting average against (.251)...Jimenez made 2nd straight Opening Day start for Rockies, April 1 vs. ARI...Became just the 4th pitcher in club history tostart two-straight Opening Day games, joining Kevin Ritz (1996-97), Darryl Kile (1998-99) & Mike Hampton (2001-02)...Was on the 15-day DL from April 2-18 w/a torn cuticle on his right pitching thumb that dated back to spring training...Went 0-1 w/a 6.75 ERA in 3 April starts (16.0IP, 14H, 12ER) & 0-4 w/a 5.45 ERA in 6 May starts (34.2IP, 33H, 21ER)and was also bothered by right groin problems...Did not win his 1st game until his 10th start of the year on June 1 at LA Dodgers (9.0IP, 4H, 0R, 0BB, 7K), his 3rdcareer shutout...Went 3-2 w/a 2.45 ERA in 6 June starts (40.1IP, 37H, 11ER, 33K).... From June 1-July 24 he went 6-4with a 3.03 ERA (71.1IP, 69H, 24ER, 17BB, 71K)...Won a season-high 3 straight starts from July 9-19 (20.2IP, 18H,5ER, 21K)... Struck out 40 batters in 32.0 July innings with Colorado...Last start of July 31 at SD was career shortest(1.0IP, removed after being traded)...He left Colorado as the all-time career franchise leader in strikeouts (773), 2nd in career ERA (3.66), 3rd in wins (56)and 4th in innings pitched (851.0) and starts (137)...Over his last 17 starts with Colorado from May 6-July 30 he went6-7 w/a 3.93 ERA (103.0IP, 98H, 45ER, 98K)...Struck out 7 or more batters in 7 of his 12GS with Colorado...Made Indians debut August 5 in Texas as he did not receive a decision in the Indians 8-7 loss to the Rangers... 5.0IP,7H, 5R/ER, 3BB, 7K, HR to Napoli... Earned 1st AL win & 1st win as Indian August 10 vs. Detroit... 8.0IP, 5H, 3R/0ER,BB, 6K... Suffered 1st loss on Aug. 21 at Detroit...3.1IP, 9H, 8R/8ER, 3BB, 4K... 8ER allowed a career-high... Earnedhis 2nd AL win on August 26 vs. Kansas City (7.0IP, 7H, 1ER, 1BB, 10K)...His 10K were a season-high, the 11th doubledigitstrikeout game of his career and the most strikeouts thrown by an Indians starting pitcher since Justin Mastersonon Sept. 30, 2009 vs. CHW (12K)...Lost last 2GS of the year (12.0IP, 15H, 10ER, 10K)...From August 26 thru the end of the season he was 3-3 w/a 4.06 ERA in his final 7 starts (44.1IP, 38H, 20ER, 40K, .228AVG)...Allowed a combined 24 steals against 6CS on the season...Worked at least 5.0IP in 27 of 32 starts...Combinedon the year LHH batted .239 (85-356) off him. Had a record breaking 2010 season, as he set personal and franchise records in several pitching categories...set the Rockies record for a single season starter in wins (19), ERA (2.88), strikeouts (214),opponents batting average (.209) and fewest home runs allowed (10)...he also had a Rockies record 9-straight winning decisions (5/15-7/8) and set a club record for any pitcher by tossing 33.0 consecutivescoreless innings 5/15-6/6...his 221.2 innings pitched set a new career high (3rd in Rockies history)...Became the first pitcher in Rockies history to toss a no-hitter when he twirled the trick on 4/17 atATL...entering the game, four existing teams in the MLB had not tossed a no-hitter: COL (1993), TB(1998), SD (1969) and NYM (1962)...prior to his no-hitter, the longest a Colorado pitcher had gone intoa no-hitter was Jason Jennings, who went 6.2 ip without giving up a hit on 8/1/02 at PIT (source: EliasSports Bureau)...Jimenez threw a career-high 128 pitches, 72 strikes, one more than his previous high(127 pitches, 6/12/09 vs. SEA)...his fastball averaged 96.8 mph...he faced 31 consecutive batters withoutallowing a hit during the no-hitter...is the 4th Dominican player to throw a no-hitter...Jimenez is the first NL pitcher to have at least 16 wins in one season before 8/1 since 2002, when CurtSchilling (ARI) had an 18-3 record at the end of July...with his 14th win, 6/28 at SD, he became the firstpitcher to have 14 wins in his first 16 starts since Pedro Martinez in 1999 (14-2 in his first 16 starts)...thelast pitcher to go 14-1 or better in his first 16 starts was John Smoltz in 1996 (14-1)...on 6/17 at MIN hebecame the first pitcher in 24 years to win at least 13 of his first 14 starts; the last was Roger Clemens,who went 14-0 in his first 15 starts for the Red Sox in 1986...Jiminez is the first NL pitcher to win 13 ofhis first 14 starts in 98 years, since Rube Marquard of the NY Giants won his first 18 starts in 1912...Had two consecutive scoreless innings pitched streaks of 25.0 innings or longer in 2010 (also: 25.1innings 4/17-5/3)...the last pitcher to have two scoreless innings pitched streaks of at least 25.0 inningsin a season was Jack Morris in 1986, and since STATS began tracking this in 1974, no pitcher has everhad two 25.0-plus scoreless innings pitched streaks prior to the All-Star Break, as Jimenez did in 2010...Is the third pitcher in history to allow 2-or-less runs in each of his first 12 starts of a season...others wereDetroit's Al Benton, in first 15 starts (1945) and Cincinnati's E. Volquez in his first 12 starts (2008)...With his win 7/8 vs. STL he became the first NL pitcher to have at least 15 wins prior to the ASG sinceGreg Maddux in 1988 when he was 15-3 with CHC...is just the 26th pitcher in MLB history to have 15pre-ASG wins...Named to his first career All-Star team, and became the first Rockies pitcher to start the All-Stargame...he's the sixth Rox pitcher named to an All-Star team. Set career highs in wins (15), innings and strikeouts...increased his win total for the 3rd straightseason...finished strong, going 9-3 with a 3.08 ERA (102.1 ip, 35 er) after the All-Star break...had winningrecords in just 3 of 7 months; earned season-high 5 wins in August...set club record for quality starts (24),ahead of Jason Jennings (20 in 2006)...pitched at least 6 innings in 29 of his starts, including franchise-best25 consecutive outings from 5/1-9/7...threw 2nd-most pitches (3,570) in the NL, behind only St. Louis'starter tonight Adam Wainwright (3,614); threw 100 or more pitches in 29 of his 33 starts...limited opposinghitters to a .229 avg., the 8th-lowest mark in the NL...his opp. slugging pct. of .326 was the 4th-lowest markin the NL in '09...gave up just 13 HR's and never allowed more than one homer in any of his starts...finished5th in the NL with a 2.07 groundball/flyball ratio; only Jimenez and Adam Wainwright (STL) wereamong the top 10 NL pitchers in both ground ball/fly ball ratio and strikeouts...went 8-5 at Coors Field, andhas lowered his ERA in Denver in every year of his career...had a .500 winning pct. on the road (7-7),despite a 3.69 ERA away from home...opponents were successful in stolen base attempts 15-out-of-21times...recorded 8 strikeouts in his season debut 4/7 at ARI; faced Dan Haren and earned the win...earneda decision in each of his first 7 starts; lost 4 consecutive decisions from 4/13-5/1...pitched 42.1 homerlessinnings to open the season before allowing a home run to Nate McLouth 5/17 vs. PIT, giving him the 3rdlongeststreak to start a season in Rockies history...tossed 2nd career complete game 6/12 vs. SEA (last:7/22/08 vs. LAD); threw career-high 127 pitches (previous high: 117 pitches in 7.0 ip 5/16/08 vs. SD)...won3 consecutive starts from June 7-18, going 3-0 with a 2.66 ERA (23.2 ip, 7 er) in that span...snapped 4-startwinless streak with his 7th victory 7/17 at SD; fanned season-high 10 Padres for his 5th career game of 10-plus strikeouts...won career-best 6 straight decisions over a span of 8 starts, 7/17-8/23...earned a win in 5consecutive starts, 8/1-23; during his 6-game win-streak (8 starts) he went 6-0 with a 2.45 ERA (58.2 ip, 16er)...had 6-game win streak snapped 8/28 at SF despite logging his 10th consecutive quality start; facedTim Lincecum for the 2nd consecutive start...finished August tied with Chris Carpenter for the NL lead inwins for the month (5-1); his 1.77 ERA (45.2 ip, 9 er) also ranked 3rd among NL hurlers while his 38 strikeoutsranked T-7th...Jimenez finished as a runner-up in the NL Pitcher of the Month voting, as ChrisCarpenter won the award (although Jimenez had the same amount of wins, a lower ERA and more strikeouts)...had a string of 12 consecutive quality starts from 7/10-9/7, as the club went 9-3 in those games...wastagged for 7 runs (6 earned) in 2.2 innings 9/15 at SF in his first start since straining hishamstring...rebounded from his loss vs. SF to earn the win 9/20 at ARI by allowing just one run in 7.0innings with 8 strikeouts...would take his 13th and final loss 9/26 vs. STL...tossed 7.0 innings but allowed4 runs in the Rox 6-3 loss...finished the season by earning the win win 10/2 at LAD...allowed just one runin 6.0 inning and matched a season high with 10 strikeouts (also: 7/17 at SD)...hit .220 (13-for-59) with 6walks in '09; his batting avg. was the 5th-highest mark among NL pitchers...entered the 2009 season withjust 6 hits in 94 AB's...appeared in one game for the Dominican Republic in the World Baseball Classic onMarch 10 vs. the Netherlands and set a WBC record with 10 K's. In his first full season in the Majors, became one of only two Rockies right-handed pitchers all- time, along with teammate Aaron Cook, to win 10-plus games and have a sub-4.00 ERA in the same sea- son (both did so in '08)...went 12-12 with a 3.99 ERA...despite his 12-12 record, Jimenez allowed 3 earned runs or less in 27 of his 34 starts (club went 15-19 in his starts)...recorded 172 strikeouts, the 3rd-most in a single season in franchise history, and the most since Pedro Astacio struck out 193 in 2000...his 172 strikeouts are the most for any Rockies pitcher not named Pedro Astacio...the 172 strikeouts also ranked 14th in the NL...his 7.79 strikeouts/9 ip was the 14th-best mark in the NL...led the Rockies, and tied with 8 other NL pitchers for the most games started in the NL (34)...Jimenez finished 2nd in the NL with both 103 walks and 16 wild pitches in 2008...opponents hit just .245 (182-for-744) off him this season, with left- ies at .248 (98-for-395) and righties at .241 (84-for-349)...just 51 of his 182 hits allowed went for extra bases (.348 slugging pct. )...the .245 opponents average is the 2nd-lowest opp. avg. in franchise history for a starter, as only Shawn Chacon's .245 mark (124-for-511) in 2003 is lower...opponents posted a .348 slug- ging percentage against him, the 6th lowest opponents slugging percentage in the NL; that mark is the low- est mark ever for a Rockies starter, nearly 40 points lower than the previous Rockies best of .386 slug. pct. Jason Jennings allowed in 2006...allowed 11 home runs in '08, tied with Tim Lincecum and Jair Jurrjens for the fewest home runs allowed in the NL...the 11 homers allowed are also the fewest ever for a Rockies starter with at least 25 starts in a single season...led the Rockies with 3 games of 10-plus strikeouts, includ-J I M E N E Z ing career-best 11 strikeouts 5/10 at SD...the 11 K's in a single game are tied for the 7th most in franchise history, and the most since John Thomson had 12 K's 10/7/01 vs. SD...after going 1-1 in his first 2 starts of the season, Jimenez went through a stretch in which the Rockies lost 10 straight games in which he start- ed from 4/15-6/1...Jimenez personally lost 6 straight decisions from 4/15-6/16 before finally earning his 2nd win of the season 6/21 vs. NYM (despite the 10-game losing streak, he allowed 3 earned runs or more in just 2 of the 10 starts)...after dropping 11 of his first 12 starts, the Rockies won 9 of his next 12 starts from 6/6-8/1...Jimenez earned his first road victory of the season in what was his 10th road start of 2008 on 7/7 at MIL; allowed 3 hits in 7.0 scoreless innings with 7 strikeouts...was his first road start of the season to toss as many as 7.0 innings and the first road start he allowed no runs...finished the season with 100 strike- outs in 95.1 innings in 18 road starts...his 9.44 strikeouts per 9 innings ratio on the road was the 4th-best mark in the NL, behind Tim Lincecum, Edinson Volquez and teammate Jorge De La Rosa (9.57)...despite tossing his 3rd consecutive quality start Jimenez took the loss 7/12 at NYM in his only loss of July...Jimenez opened the Rockies post All-Star schedule on the mound 7/17 vs. PIT and earned the first of 4 consecutive starts with a win...in his next start 7/22 vs. LA, he tossed the first complete game of his career; allowed just 4 hits and one run in 9.0 innings, as the only run he allowed came on a Matt Kemp solo homer to lead off the 9th...Jimenez became the 2nd Rockies pitcher to toss a complete game in '08 (also Cook)...lowered his season ERA to 3.98 in that start, the first time it was below 4.00 all season...earned his 2nd road win of the season in his next start 7/27 at CIN; pitched 6.0 scoreless innings to earn the win and extend his quality start streak to 6 straight starts...in his first start of August he sealed his 4th straight win 8/1 at FLA; allowed no runs for the 2nd straight start...the consecutive road victories was a career first...lost each of his next 2 starts before earning another victory 8/19 at LA; was his 3rd consecutive road start with a win, extending a career long streak...began September with a win 9/5 vs. HOU...was his 10th win of the season, joining teammate Aaron Cook with double digit victories...Jorge De La Rosa would also win 10 games on the season, giving the Rockies 3 pitchers with 10 or more victories in a single season for the first time since 2003...earned victories in consecutive starts 9/16-23 vs. SD and at SF...the two victo- ries gave him 12 on the season...in his final start of the season 9/28 at ARI (Rockies last game of '08) Jimenez tossed 7.0 shutout innings with 10 K's; the 7.0 shutout frames lowered his season ERA to 3.99, while the 10 K's allowed him to pass Jeff Francis (2007-165 K's) and Pedro Astacio (1998-170 K's) for 3rd on the Rox single season strikeout list...opposing base runners were successful in 19 of 22 stolen base attempts with Jimenez on the mound in 2008. Jimenez provided a season-half lift to an injured Rockies rotation, going 4-4 with a 4.28 ERA(82.0 ip, 39 er) in 15 games/starts for Colorado after joining the club...despite spending the first-half in theminors, he ended up ranking fourth on the Rockies staff with 68 strikeouts...also ranked fifth on staff instarts...opponents batted just .228 (70-for-307), .212 (32-for-151) by right-handers and .244 (38-for-156)vs. lefties...made nine quality starts, as team had a 7-8 record in his 15 starts overall...threw at least 6.0innings nine times, 7.0+ frames on three occasions...fared better at Coors Field (3-3, 3.81 ERA in 9 starts) thanon the road (1-1, 5.01 in 6 starts)...averaged 4.50 runs of support per nine innings in his starts...went 1-0, 3.50(18.0 ip, 7 er) over first three starts this season July 19-29, then lost two straight Aug. 4-9, allowing 11 earnedruns in 6.2 innings to raise ERA to 6.57...from Aug. 15-Sept. 10, went 2-1, 2.39 (37.2 ip, 10 er) in six startsto drop season figure to 4.04, holding opposition to a .174 (23-for-132) average in that span...beginningSept. 15, went 1-1 with a 5.03 ERA (19.2 ip, 11 er) in his final four starts to finish at 4.28...was recalled fromTriple-A Colorado Springs prior to the game on July 17 at Pittsburgh, originally as another arm for a spentbullpen, but ended up taking slot of Taylor Buchholz in the rotation...spent the entire season at ColoradoSprings prior to his recall, going 8-5 with a 5.85 ERA (103.0 ip, 67 er) in 19 games/starts for the SkySox...Pacific Coast League opponents batted .279 (110-for-394) off Jimenez with nine HR, 62 walks, and 89strikeouts...led the team in innings pitched, strikeouts, and was tied for the team lead in wins at time of hispromotion...won his final three starts at Triple-A, compilinga 2.89 ERA (18.2 ip, 6 er) during that span to dropfrom 6.51 to 5.85, his lowest figure of theseason...earned a win in five of his last seven starts at Triple-A beginning June 12, posting a 3.54 ERA (40.2 ip, 16er) in that stretch...last Triple-A outing came on July13 vs. Tucson (G1), earning win in the Sky Sox' 13-2victory (7.0 ip, 6 h, 2 r-er, 3 bb, 3 so, 0 hr)...was creditedwith his third career complete game in the contest...just five of his 19 starts with the Sky Sox were quality outings...averaged approximately 97 pitches pergame...took no decision in his Rockies season debut on July 19 at Washington, allowing two runs in 5.0innings in Rockies' 5-4, 10-inning walk-off defeat at RFK...allowed double to leadoff batter in the sixth andexited with a 4-1 lead...Jeremy Affeldt suffered blown save when he allowed two runs in the eighth inning,although one was aided by a Brad Hawpe error...Rox lost in the 10th on a pinch walk-off RBI single byD'Angelo Jimenez...Jimenez had been 0-for-19 in the pinch this season prior to that pinch hit...took nodecision in next start on July 24 vs. San Diego (7.0 ip, 4 h, 3 r-er), a 5-3 Rockies loss...all three runs allowedin that game came on a Mike Cameron two-out, three-run homer in the first inning...the 7.0 innings matched hislongest career outing...earned his first Major League win on July 29 vs. Los Angeles (6.0 ip, 4 h, 2 r-er), a9-6 victory that secured the club's first series win against the Dodgers since '05...took first career loss inRockies' 6-4 defeat on Aug. 4 at Atlanta, allowing six runs in 4.2 innings...was pitching in front of his fatheras a professional in Atlanta...earned win on Aug. 15 at San Diego, tossing 6.0 shutout innings in Colorado's3-0 win...did not allow a runner past second base...in his first career road win, became just the 3rd rookiein franchise history with nine strikeouts in a game, joining Shawn Chacon (13 K's, June 7, 2001 vs. Houston)and Jason Jennings (9 K's, May 15, 2002 vs. Florida)...took no decision on Aug. 20 vs. Pittsburgh despiteallowing only one run over 7.0 innings in Rockies' 4-2, 11-inning defeat...retired 18 of his final 21 battersfaced, stranding all three runners in final six innings after leadoff hits in 3 different frames...retired final 12 battersfaced, as well as 19 of final 21 batters faced, in win on Aug. 25 vs. Washington...took no decision Aug.31 at Arizona in Rockies' 4-3, 10-inning comeback win (6.2 ip, 3 h, 3 r-er)...allowed just two hits and no runsthrough six innings, then retired his first two batters faced in the seventh...with game still tied 0-0, he issued a two-outwalk to Drew and hit Mark Reynolds with a pitch...next batter, Miguel Montero, on first pitch after a visit bypitching coach Bob Apodaca, hit a three-run homer for the game's first runs...Jimenez came out of the game,but Rox scored twice in the eighth, once in the ninth, and four times in the 10th inning to win that series opener...allowed two-run HR to Barry Bonds in loss on Sept. 5 vs. San Francisco, which a fan actually reachedover the wall to catch...left with a 5-2 lead on Sept. 10 at Philadelphia, but Jorge Julio gave up a three-runhomer to Pat Burrell in the seventh and Ryan Howard drove in the winning run in the 10th frame...received ano decision in his final start of the regular season on Sept. 30 vs. Arizona...in a must-win game for Coloradoto keep their playoff hopes alive, Jimenez tossed 6.1 innings, allowing just one run on one hit with a careerhigh10 strikeouts...had a no-hitter for 5.1 innings before allowing a single to Alberto Callaspo with one outin the sixth inning...exited with a 1-0 lead, but Jorge Julio allowed inherited runner to score...the Rockiesscored three runs in the eighth inning and held on for the 4-3 win...Jimenez's 10 strikeouts, matched the most bya Rockie starter all season and it was the second-highest single-game strikeout total ever by a Colorado rookiebehind only 13 strikeouts by Shawn Chacon on June 7, 2001 vs. Houston. Jimenez's long-awaited major league debut came in the form of two appearances for Colorado in late September...had no record with a 3.52 ERA (7.2 ip, 3 er) in two games/one start for the Rockies...split the rest of the year between Tulsa and Colorado Springs...ended the season at Triple-A and joined the Rockies at the conclusion of the PCL campaign, but was not added to the roster...was recalled on Sept. 21...made his major league debut in relief on Sept. 26 vs. Los Angeles...allowed two hits in a scoreless 8th inning...other game was his lone start, as he started the season finale on Oct. 1 at Chicago-NL...allowed four runs (3 earned) on just three hits in 6.2 innings...gave up a two-run homer to Aramis Ramirez in the 4th inning, but exited with a 4-2 lead and wound up with a no decision...combined to go 14-4, 3.80 (151.2 ip, 64 er) with 150 strikeouts in 26 games/starts in the minor leagues...his 14 wins was most among pitchers in Rockies system, while the strikeout total ranked third in the organization...began the year with Tulsa, going 9-2 with a 2.45 ERA (73.1 ip, 20 er) in 13 games/starts for the Drillers...had 86 strikeouts against 40 walks...despite spending only third months in the Texas League, still ranked T2nd among Drillers in wins and third in strikeouts...opponents hit .194, .178 (21-for-118) by lefties and .209 (28-for-134) by right-handers...had four starts with 10+ strikeouts, including season-high 11 K's on April 20 at Arkansas...struck out 11 of 21 batters faced in that outing...went 7-0 in his final eight starts, and allowed just one run in his last five games and 32.0 innings (0.28 ERA)...in those final five Texas League starts, opponents hit just .099 (10-for-101)...only game longer than 6.0 innings was complete game three-hit shutout on June 9 vs. Arkansas...allowed just two total hits in final two starts and 11.0 innings...was starting pitcher for North squad in Texas League All-Star Game on June 20 at Little Rock's Ray Winder Field, tossing 2.0 shutout innings with three K's...named sixth-best Texas League prospect by Baseball America after the season...final start at Double-A was June 25 vs. Midland, and was promoted to Triple-A on June 30...went 5-2, 5.06 (78.1 ip, 44 er) in 13 games/starts for the Sky Sox in his first action above Double-A...opponents hit .252, .266 (41-for-154) by lefties and .236 (33-for-140) by right-handers...posted seven K's twice in the PCL...took loss in Triple-A debut on June 30 vs. Portland, allowing six runs in 5.1 innings...won three straight starts July 28-Aug. 7, securing second win in that span on Aug. 2 vs. Round Rock despite allowing 8 runs in 5.0 innings...Sky Sox won that game 10-9...won two of final three starts to end the PCL season, compiling a 1.89 ERA (19.0 ip, 4 er) in those outings...made five starts for Licey in Dominican Winter League. Combined to go 7-8 with a 4.66 ERA (135.1 ip, 70 er) in 26 games/25 starts while returning from a shoulder injury in '04...ranked 2nd in the Rockies system with 131 strikeouts...began the year with Modesto of the High-A California League, a circuit he had briefly dominated in 2004 prior to injury...went 5-3, 3.98 (72.1 ip, 32 er) in 14 games/starts for the Nuts...held opponents to a .232 average, posting 7 or more strikeouts on 6 occasions...of his first 5 outings, 4 were less than 5.0 innings...compiled a 2.91 ERA (43.1 ip, 14 er) over his first 9 appearances, going 3-0 in that span while allowing more than 2 earned runs just once...tossed 10.0 shutout innings over 2 starts, April 22 at San Jose and April 27 vs. Lancaster, allowing just 4 hits and 2 walks in those contests...his 3 losses with Modesto came in consecutive outings from May 31-June 11, going 0-3, 9.60 (15.0 ip, 16 er) in that stretch...won final 2 outings after those losses, combining to allow just 2 runs in 14.0 innings on 5 hits and 4 walks with 17 strikeouts...posted season-high 9 K's in his final Modesto start on June 22 vs. High Desert...was Cal League's starting pitcher for All-Star Game against Carolina League on June 28 in Frederick, Maryland, striking out 2 of his 3 batters faced in 1.0 inning of work...was promoted to Tulsa after that appearance...went 2-5, 5.43 (63.0 ip, 38 er) in 12 games/11 starts for the Drillers, holding Texas League right-handers to a .194 average (19-for-98)...earned win in his Double-A debut on July 3 vs. Arkansas, allowing 4 runs (3 earned) in 5.0 innings...took no decision in 3rd start on July 14 vs. Frisco despite allowing 2 runs in 7.0 innings with 6 K's...permitted 8 runs in 4.0 innings in next start on July 19 at Arkansas, taking loss...earned 2nd and final victory on Aug. 5 vs. Wichita, allowing just one run on 3 hits in 7.0 innings...exited after just 6 batters on Aug. 17 vs. Corpus Christi, but pitched in relief 6 days later on Aug. 23 at Springfield, allowing 3 runs in 5.1 innings...was just the 2nd relief appearance of his career...made 2 starts to end the season, tossing 5.0 innings and taking no decision in each outing...made one start in playoffs for Tulsa, taking loss in season-ending game on Sept. 8 at Arkansas...pitched for Licey in the Dominican Winter League. Jimenez missed the majority of 2004 due to a scapular stress reaction in his right shoulder (posteriorshoulder strain)...he still made nine starts for High-A Visalia, going 4-1 with a 2.23 ERA...in 44.1innings, the right-hander allowed only 29 hits (.184 average against) with 12 walks and 61strikeouts...made his first start of the year on April 9 vs. San Jose and struckout 12 batters over 6.0 inningswhile allowing only 3 baserunners (2 hits, 1 walk) in a 4-1 victory...followed that up with an even better performancein his second start, April 14 at Stockton, hurling 6.0 hitless innings with 3 walks and 9 punchoutsin a 3-0 combined shutout...tossed the Cal League's first complete game of the year on May 1 vs. Stockton(Game 1), yielding 1 hit and 1 run over 7.0 innings...was named the organizational player of the month forApril (3-0, 1.57 ERA)...through his first six starts of 2004, Jimenez was 4-0 with a 1.50 ERA and had fanned53 batters in 36 innings (13.25 per 9.0 IP)...at the time, the 20-year old sat atop Baseball America's"Prospect Hot Sheet" of the best prospects in all of minor league baseball...was pulled after just 3.0 inningsduring a May 18th start vs. Stockton due to a right shoulder strain, an injury that would essentially end hisseason...was placed on the disabled list May 25...tried to make a comeback late in the year, getting a starton Aug. 1 vs. San Jose only to be removed after 2 pitches because of discomfort in the shoulder...did participatein the Fall Instructional League with no problems. In his first full season in the United States, Jimenez ranked fourth in the South Atlantic League in strikeouts (138), fifth in innings (153.2) and T4th in starts (27) at Class A Asheville...also ranked T3rd with 67 walks...had a no-hitter for 7.1 innings during a June 18 start at South Georgia, finishing with one hit over 8.0 innings...named SAL Pitcher of the Week, July 25-31, during which he was 2-0 with a 0.64 ERA in 2 starts (14.0 ip, 1 er)...was transferred to Visalia on Aug. 31 in time for the Cal League playoffs...made one start for the Oaks in Game 3 of semifinals vs. Stockton and lost a 2-1 decision (5.0 ip, 2 h, 2 er, 5 bb, 4 k). Began season in the Dominican Summer League before reporting to Rookie-Level Casper for the start of their season in late June...he made 14 starts for Casper, going 3-5 with a 6.53 ERA...struck out 65 batters in 62.0 innings with 29 walks...led the Pioneer League with 45 earned runs. Made his pro debut in the Dominican Summer League. November 2, 2017 RHP Ubaldo Jimenez elected free agency. July 26, 2016 Baltimore Orioles activated RHP Ubaldo Jimenez. July 23, 2016 Baltimore Orioles placed RHP Ubaldo Jimenez on the paternity list. October 17, 2014 Baltimore Orioles activated RHP Ubaldo Jimenez. October 10, 2014 Baltimore Orioles reassigned RHP Ubaldo Jimenez to the minor leagues. August 9, 2014 Baltimore Orioles activated RHP Ubaldo Jimenez from the 15-day disabled list. August 9, 2014 Norfolk Tides activated RHP Ubaldo Jimenez. August 3, 2014 Baltimore Orioles sent RHP Ubaldo Jimenez on a rehab assignment to Norfolk Tides. July 29, 2014 Baltimore Orioles sent RHP Ubaldo Jimenez on a rehab assignment to Aberdeen IronBirds. February 19, 2014 Baltimore Orioles signed free agent RHP Ubaldo Jimenez. 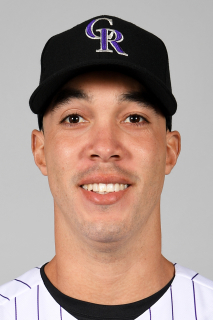 November 1, 2013 RHP Ubaldo Jimenez elected free agency. October 4, 2013 Cleveland Indians activated RHP Ubaldo Jimenez. October 2, 2013 Cleveland Indians reassigned RHP Ubaldo Jimenez to the minor leagues. October 12, 2011 RHP Ubaldo Jimenez assigned to Tigres del Licey. August 3, 2011 Cleveland Indians activated RHP Ubaldo Jimenez. July 31, 2011 Colorado Rockies Traded RHP Ubaldo Jimenez to Cleveland Indians; Cleveland Indians Traded RHP Alex White to Colorado Rockies and Akron Aeros Traded RHP Joe Gardner and RF Matt McBride to Tulsa Drillers. April 19, 2011 Ubaldo Jimenez roster status changed by Colorado Rockies. April 6, 2011 Ubaldo Jimenez roster status changed by Colorado Rockies. December 8, 2009 RHP Ubaldo Jimenez assigned to Tigres del Licey.